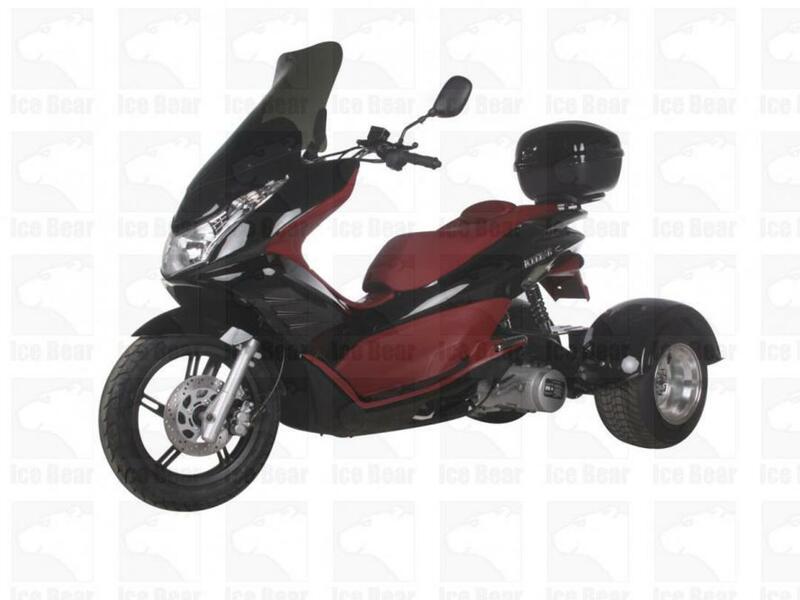 150cc three wheel trike for sale, buy today, shipped to your door within 5 -10 days. Comes equipped with a Honda cloned 150cc engine, automatic centrifugal clutch, no gears to shift, also comes with a free hitch on the rear for light towing. It is the perfect choice for those that prefer the security of a three-wheel 150cc scooter as opposed to the traditional two-wheel scooter. This trike will cross the generational divide from the *teenager to the senior citizen for transportation needs whether it be for school, work or play. Get yours today while inventory last! Special Incentive Price: $281.00 see "add to cart" for details, if the assembly is chosen please allow for 3 to 4 weeks for delivery. The continuously variable torque converter transmission always provides just the right amount of power. The high torque of the 4-cycle engine provides more than enough power to climb just about any hill you will ever encounter. Carburetion is 15mm and CV with automatic choke. Also has Ignition CDI & Kickstart, it's Operation is extremely simple. Speed is controlled by the twist grip throttle. There is no clutch to operate as the drive system is completely automatic. This vehicle holds 1-3.5 gallon of gas and can be located in the specifications table above, giving your cycle a range of 70-115 miles, depending on rider weight and terrain.